Happy Easter! This is the season again to eat lots of CHOCOLATES and HOT CROSS BUNS! Seeing every bakery and supermarkets selling lots and lots of hot cross buns these days, I can't stop thinking that I need to bake hot cross buns again. I love this idea and so I researched and googled around for the best chocolate hot cross buns recipe and all I can find is this from Taste.com.au. Coincidentally, I saw Veronica from Veronica's Kitchen using the same recipe too to make her hot cross buns! These buns are very extremely delicious when they were freshly baked. For my experimental purpose, I've kept a bun to see if it will stay fresh on the next day and kept another one in the freezer as my "comparison" bun. I'm not surprised at all to know that the "freezer" bun retained its texture better than the one kept at room temperature but when both of them were lightly toasted in the oven, they were equally soft and delicious again! 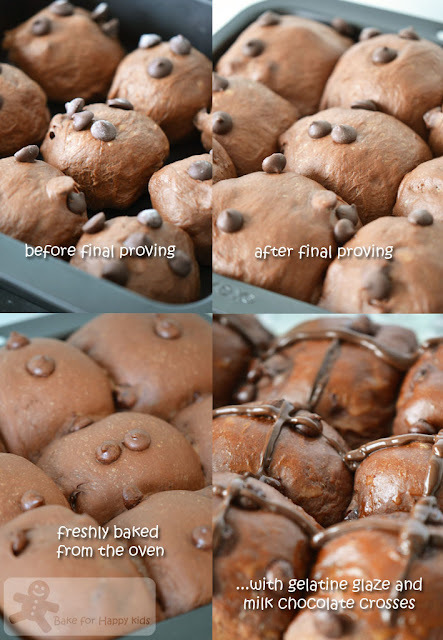 Update on 18 Mar 2019: Like very chocolaty hot cross buns, I would strongly recommend you to try my Super Soft Chocolate Hot Cross recipe at here. HIGHLY HIGHLY HIGHLY RECOMMENDED!!! Instead of flour paste, I'm making the crosses by piping melted milk chocolate on the buns (40g of chocolate is required to make crosses for 9 buns). Grease a 6cm-deep, 23cm (base) square cake pan. Place yeast, milk and 1 tbsp sugar in a bowl. Whisk to dissolve yeast. Cover. Set aside in a warm place for 10 minutes or until foamy. Sift flour and cocoa into a bowl. Rub in butter until mixture resembles fine breadcrumbs. Make a well in center. Add yeast mixture, egg and remaining sugar. Stir to combine. Turn dough onto a lightly floured surface. Knead for 1 minute. Transfer to a lightly oiled bowl. Cover. Set aside in a warm place for 1 hr or until doubled in size. Punch down dough. Turn onto a floured surface. Knead for 5 min or until smooth. Add choc bits. Knead to combine. Roll into 16 balls. Place in prepared pan. Cover. Set aside in a warm place for 30 min (I had mine set aside for 1 hr) or until slightly risen. Preheat oven to 200°C/180°C fan forced. Meanwhile, make paste Combine flour, sugar and 2 1/2 tbsp cold water in a bowl. Spoon into a snap-lock bag. Snip 1 corner from bag. Pipe crosses onto buns. Bake for 10 minutes. Reduce heat to 180°C/160°C fan forced. Cook for 20 min or until golden and cooked through. Meanwhile, sprinkle gelatine over boiling water in a heatproof jug. Stir with a fork until gelatine has dissolved. Place buns, top-side up, on a wire rack. Brush tops with gelatine mixture. Cool. Serve with butter. Note: Using half the recipe, I'm making 9 buns using 20 cm sq pan. I didn't make the crosses using this flour paste recipe and bake the buns at 160°C fan forced for 20 min. Hohoho, Zoe made chocolate hot cross buns, that's great news to me coz I can just enjoy this visually! What happen to June? A break? Go for the Masterchef! I don't like the latest commercial advert for Masterchef! Though I'm still a big fan of Australian MasterChefs, I have the say that the 1st 2 seasons were so much better than the 3rd season! I hope that this one will just as good as the 1st 2 seasons! Instead of having the event in every month, I'm organizing "Cook like a Star" once in every two months. Your buns looks wonderful! Great with a cup of hot black coffee! Oh my word. I am actually right now eating a hot cross bun. But it looks nothing like this. Nothing at ALL. It pales in comparison. These look scrumptious! Wow! The chocolate hot cross looks very good. It is the University level, my cooking and baking is still at kindergarten level. They're so beautiful!! I love the chocolate colour! How come I've never heard of chocolate hot cross buns before this? I've been so deprived! Aaahhh ... but now I'm gonna make this for sure! Come to mama! Hi Zoe! Wow! Those are some intense Hot Cross Buns! They look amazingly delicious! Simply delicious! 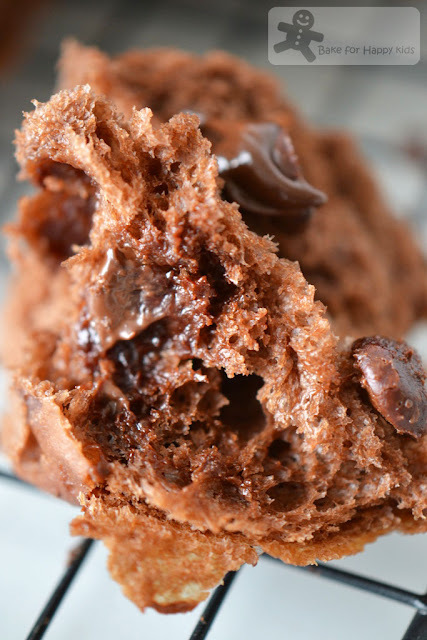 The texture of the bun from this recipe is so soft and I love the choc chip you put in! Happy Easter! Brilliant! I would never think to make chocolate hot cross buns. LOVE this!! hi zoe, they look so cute in those proving photos! They are simply gorgeous! you know, i hardly keep my buns in the freezer, next time i shall test it out like you. thanks! Zoe, your chocolaty hot cross buns looks so yummy.. These buns are just loverly and yes very chocolaty! Yumm! OH i am so drooling...this is insanely good! Ohhh, Zoe...those are delicious looking buns! I sooo love the chocolatey look! Since Easter is always during Passover I've never had hot cross buns! Looks lovely and very very chocolatey indeed! Yummm! Your hot cross buns really great! Sure stand out in the crowd. I notice the recipe start with rub in the butter with the Flour before adding liquid. And it uses all-purpose flour. Wonder how will the texture turns out. Since you replace with bread flour. Are you using the same method? Or using the bread making method and beat the dough till elastic? I prefer to replace all purpose flour with bread flour to give the bread additional "strength". I have not tried making this bread with AP flour and wonder too if it makes any differences. Very chocolaty and unique, I've never heard of this before. I saw the recipe at Taste and I was wondering how they would taste. Yours look absolutely decadent and you know I simply cannot resist to anything chocolatey! These look so chocolatey and heavenly! I think I could finish off the whole batch by myself. Thanks for visiting my blog and look forward to many more posts from you. Mmm...very delicious! Can I have some for tomorrow breakfast? 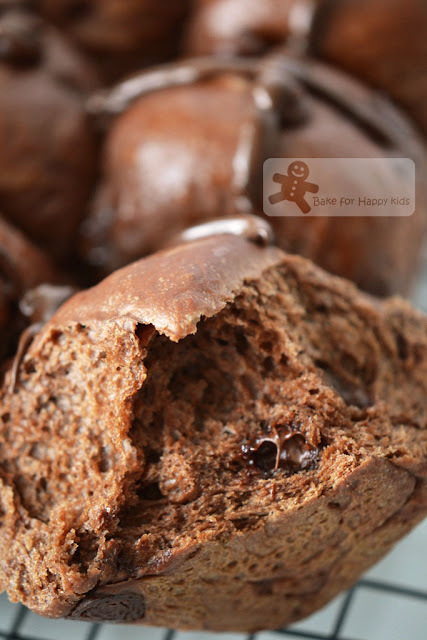 What a wonderful idea to make chocolate hot cross buns - SO clever and delicious!! Zoe, love the chocolatey hotcross buns - what a great twist and totally right for Easter which is the chocolate-iest fest of the year! In general (as you've discovered) they are a bakery item that doesn't have any shelf life but I'm very happy to toast them the next day! Yum! um, these look AMAZING! i would so love to eat these right now! As I'm a bit lazy I have thrown it into my breville bread maker, ingredients in the order of the dough recipe in my bread maker book. Its mixing at the moment..... will be interesting to see how it comes out. Love hot cross buns, never had them in chocolate. That makes me sad, will have to change that. Wonderful looking stuff over here, looking forward to coming back. Hope you have a nice Easter. It's Easter morning and I'm wondering if I'm still in time to bake these lovely chocolate hot cross buns for my family, lol! Thanks for sharing one of my favorites....yeah chocolate! Happy Easter Zoe!! Lovely soft buns and chocolaty! I love the chocolate piping too, so yummy! I am so going to make these soon as I was just given plenty of cooking chocolates. Thanks for sharing! Hi Zoe, lets exchange some of our hot cross buns since we both make the same bun this time...heehee..I prefer the choc chips hot cross buns rather than the original one. WOW! Those look awesome Zoe!!!! Thank you for stopping by and following! I am following you back! Have a Happy Easter! Oh, Zoe, my family would go nuts for these!!! Beautifully done...and happy Easter! yum!! a perfect combination of everything! Your chocolate hot cross buns look so much better and more delicious than the classic version! What a fabulous idea, Zoe! You & Veron are tempting me to bits with your plump spongy choc buns! Be glad that I'm not your neighbor..lol..Happy Easter, Zoe. Happy Easter, Zoe! That is indeed a very chocolatey hot cross bun! I've never tried a hot cross bun before :( but I want to try eating one after seeing yours! Yummy!! !Happy Easter Day to you & your family!Kisses from Greece,dear! 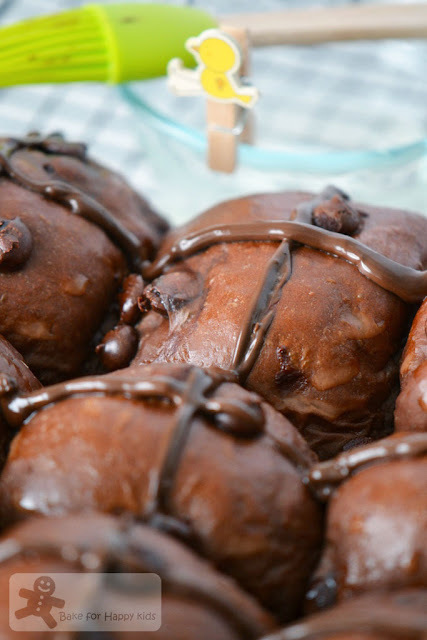 I've never tried chocolate hot cross buns but these do look very chocolatey and delicious! Happy Easter Zoe! Zoe, this bread surely looks fantastic. Reminds me of Jusco chocolate hot cross buns! Yours looks as great. Truly tempting. Thanks for sharing it. Um WOW> I've never gotten to excited for hot cross buns.... but chocolate ones? Yes please! Ohhhh these look delicious! Thanks so much for stopping by my blog! Mmmm, now those look like my kind of hot cross buns! I've never made the regular ones and see them and just think--meh. But chocolate---yes!